PicPick is a Free All-In-One Image Editor, Color Picker and Screen Capture tool. Upon launching the software, it resides in the system tray for quick access to it’s tools. 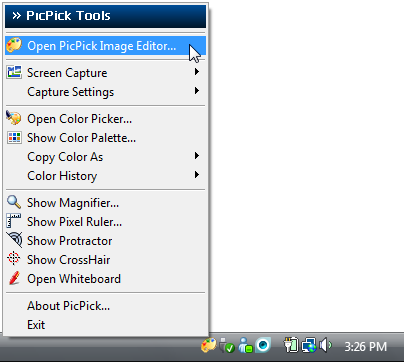 PicPick features a Screenshot capture tool, image editor, color picker or chooser, color palette, pixel ruler, protractor, crosshair, whiteboard and more. Moreover, PicPick is portable, so it can be taken with you and run from any PC.